"But what ... is it good for?" -Engineer at the Advanced Computing Systems Division of IBM, 1968, commenting on the microchip. What a difference hindsight can make. Though I'm sure some of those quotes were accurate in the context of the times in which they were spoken. The map here is just a screenshot. Follow the link to see the real-time map, and the legend that explains what the numbers mean. HYDE PARK, Mass.-- Fire destroyed Terisa Acevedo's apartment nearly one month ago. She was told that everything was gone, including her 2-year-old Dachshund named Lola. But on Monday, when Acevedo, 24, went back to her apartment to tend to some business, she heard some scratching at the door, MyFoxBoston reports. "I called out her name and she started crying. She's been in the house the whole time!" Acevedo said. It says Lola's recuperating at an animal hospital now. She must have hid during the fire. Then to survive for a whole month, during a MA winter... the poor snookie. She's lucky to be alive. (NECN: Boston, Mass.) - A doctor at the MSPCA-Angell Animal Medical Center presented a healed-up Lola back to her owner on Thursday. Are you ready for Firefox 4.0? Is IE9? [...] Firefox 4 clocked about 5 million downloads on its first day and is fast approaching 7 million this morning, as the new browser from Mozilla attracts huge interest from around the world. Even though Windows XP is nearly 10 years old at this point, more than 40 percent of Internet users are still clinging to it, putting IE9 at a disadvantage in the numbers game by not supporting XP. IE9 is slow and horrible. The article goes on to talk about how Google's Chrome browser now has 11 percent of browser market share. It also works with XP, and Mac as well. I've used Chrome, and it's pretty good. It didn't take long for Mozilla's Firefox 4 to gain immense popularity. As of this writing, millions of people have downloaded the new browser and by the look of things, its appeal to Web users has yet to slow down. By all measures, Firefox 4 seems to be on top of its game, and it's ready to take on its many competitors in the browser market. But now that Firefox 4 is out to compete against Internet Explorer 9, some people are undoubtedly wondering which browser they should go with. On one hand, Firefox 4 seems to deliver some neat new features and much faster speeds. But Internet Explorer 9 is vastly improved over its predecessor. In other words, at first glance, it's not an easy choice. However, as people dig more into the differences between Internet Explorer 9 and Firefox 4, one thing becomes abundantly clear: Mozilla's option is better. It has some pretty cool features. I've downloaded it, and intend to try it out soon. It's made some changes to the menu system, making it more like some other browsers that I don't like as much; it remains to be seen if it's something I could get used to. On the plus side, it's made some improvements with tabs, adding more options, some of which sound pretty neat, and useful too. It's a good review, but ultimately I think I'm going to just have to try it and see. Senate President Peter Courtney likes to emphasize the dramatic. But he's not over-exaggerating when he talks about Oregon's potential for killer earthquakes and tsunamis. The science is what scares him: The region's last great earthquake occurred Jan. 26, 1700. Geology shows that a cataclysmic quake occurs here every 241 years, on average. Basic math shows we're overdue for The Big One, a quake that will rival or exceed Japan's devastating 9.0 earthquake. Bear in mind that thousands of people have died, and more are missing, even though Japan's earthquake preparations are far greater than Oregon's. Of course, much of the rest of the article is all about how we don't have the money to build new earthquake/tsunami resistant bridges and structures, and how we have to go ahead and do it anyway. If they hadn't already spent decades wasting our tax money on CRAP, spending way over budget, and raising taxes to the point that they've driven many revenue payers out of the state, we would have the money, or at least the ability to finance it. [...] In wake of the tsunami, which caused millions of dollars in damage in Brookings Harbor, two main themes emerged in debriefings this week: the need for more education of the population and better communication with the public. Emergency managers, coastal authorities and officials with the Oregon Department of Geology and Mineral Industries have spent a decade educating the public about tsunamis. DOGAMI has drawn initial inundation maps, outlining the danger zones, and many evacuation routes are in place. Most coastal counties have reverse 9-1-1 systems and sirens dot the coast. Periodically, emergency officials hold conference room drills, running through tsunami procedures. All that snapped into play on Friday morning, as command posts were set up, calls went out and officials knocked on doors and scoured campsites as emergency managers fielded an calls from officials, the media and residents. But in the wealth of information, with advisories, watches and warnings flowing from tsunami experts at the National Oceanic and Atmospheric Administration's center in Alaska, one simple message got lost: Tsunami waves arrive and then surge again and again and again over perhaps 24 hours. "You don't get just one wave," said Ian Madin, chief scientist at DOGAMI. "You get a series of waves. It's like dropping a pebble into glass of water. With a tsunami, the second or third wave could be the largest." Tsunamis are so infrequent in Oregon that people forget about the dangers -- and in this instance the state had hours to prepare. When a powerful earthquake hits off the coastline along the Cascadia fault, people will have 20 minutes to flee. "If you are knocked to the ground and it lasts two to three minutes, don't wait for somebody to tell you it's the big one, McCraw said. "You need to get to 50 feet elevation." DOGAMI has a full-time staffer working on outreach along with county emergency managers, but Oregon's education effort is focused on the coast. That misses the rest of the population who flock to the beach throughout the year, especially in summer. "We are a nice tourist spot," McCraw said. "What would have happened if this had been the middle of July when we would have doubled our population in the county and had school kids on the beach?" Burns said the state needs to push hotel, motel and rental owners to tack up warning signs that include show evacuation routes. On one of our ham radio nets, I heard someone speculate that we've seen earthquakes moving clockwise around the Pacific rim: Chile, New Zealand, Japan. "Maybe we're next" they said. Well if it's really traveling clockwise, I would guess Alaska might be next. But who knows? I don't doubt the possibility of a tsunami threat; but it's impossible to predict. I also have to wonder which one is most imminent; the physical or the fiscal one? And many of the preparations of the former are also applicable in dealing with the aftermath of the latter. I suppose that's convenient. Either way, I guess the Boy Scout motto applies. I want one of these. Where can I buy one? 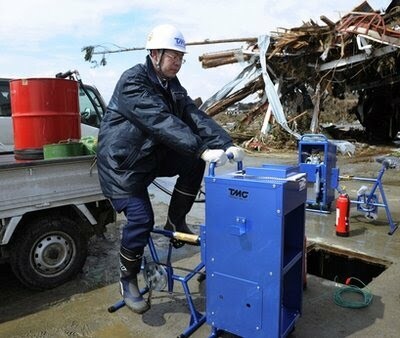 Not the Japanese policeman, but the emergency bicycle pedal pump he's using to manually pump gas from an underground tank. Such a practical and sensible device could also be used, I think, to manually pump water out of my well if our power were out for a long length of time. But alas, you can't buy it from the website, and I can't find an American distributor that carries it. A search for equivalent devices didn't turn up much: you can buy plans to build your own, or look at student projects, and various other farm-quality devices, that don't seem to be commercially available. Why are such devices not available in the USA? They could be so useful in so many ways. Maybe we need an incentive to start making them. Such devices can also be used to generate electricity. So here is an idea. In the 1930's, they had all those "pick and shovel" programs to make work for people. Obama can't do that now, because heavy machinery have replaced most those pick-and shovel jobs. But we could have a new kind of "job" instead. 1.) In our nation of obese people, it would be a way to get thinner and stay healthier. 2.) Taxpayer's would actually be getting SOMETHING in return for their money. 3.) It's GREEN energy. Hooray! Placate fanatics AND get people to work! 4.) In an emergency, "pumpers" could be deployed to pump gas, water, and generate electricity to charge batteries as needed. Isn't that what they call a win/win situation? Or does it just make too much sense? Or is it just Sunday, and I haven't drank enough coffee yet? The other responses were interesting, too. But Whitesides really made the best point, IMO. The costs have to be lowered, and free enterprise and competition will do that. And speaking of competition, I didn't see Elon Musk, the founder of SpaceX, among the folks asked the question. His company has already created a working launch vehicle and reusable spacecraft, the Dragon capsule, that flew an unmanned test mission in December, and returned safely to Earth. After the last space shuttle flight this summer, America will be without a manned space craft to take us into orbit. We shall have to rely on the Russians to ferry us back and forth, at great expense to us: $56,000,000.00 per ride. And the Russians plan to raise the price to $63,000,000.00 in 2014. A cost effective commercial alternative would be very timely, and greatly appreciated. Let the competition begin! [...] Southern California could see a significant tsunami caused either by a large earthquake off Alaska or by undersea landslides spurred by smaller earthquakes off California. Northern California is at greater risk because of the Cascadia subduction zone, which runs along the Pacific Northwest coast. Tsunami inundation map of Long Beach. Click through for a larger version.And tsunamis caused by underwater landslides off Southern California could reach as high as 40 feet, although they would be localized and quick to dissipate, said Costas Synolakis, director of the Tsunami Research Center at USC. I can only wonder how accurate the estimates are. No one will really know until it happens. Authorities battling the nuclear disaster at the Fukushima Daiichi power plant have doubled the number of workers on the site to 100 in an effort to continue cooling the three reactors and the spent fuel pools but have abandoned — at least temporarily — plans to use helicopters to dump water on the pools because of the radiation danger. Police may now use water cannons to spray the pools. Workmen are also nearly finished stringing a new power line from the electrical grid to the power plant, which could ease the situation somewhat by providing a stable source of power for valves and controls at the plant and for pumps supplying water to the spent fuel pools. It is too late for the electricity to do much good for the three endangered reactors, however, because their cooling systems all appear to have been damaged by the hydrogen explosions that have wracked the plants. Only external pumps can now be used for those reactors. Officials are particularly concerned about reactor No. 3 because it is the only reactor at the facility that is fueled with what is known as a mixed oxide fuel. The pellets in mixed oxide fuel contain both plutonium and uranium. Plutonium is highly carcinogenic in small quantities, and its release into the environment would be very dangerous. As the crisis at the power plant entered its sixth night, the situation appeared to be deteriorating. One sign was that the Japanese government increased the maximum radiation dose that workers could be exposed to from 100 millisieverts to 250 millisieverts, describing the move as "unavoidable due to the circumstances." The good news is that the reactors should be undergoing a certain amount of cooling on their own. When an operating reactor is shut down, it continues to produce a large amount of heat, known as decay heat. Within the first week after a shutdown, that decay heat declines by about 50%, experts said, so that the reactors require less external cooling. But can they keep it cool enough? If only they had the backup systems days ago, before the hydrogen explosions had damaged the cooling systems. And who are the people doing this dangerous work? (CNN) -- As the rest of the world waits with bated breath to see if Japan can avert a nuclear catastrophe, a small band of experts is putting their lives at risk to prevent the disaster. Thousands of people living near the troubled Fukushima Daiichi nuclear power plant have been evacuated from their homes because of the risk of radiation leaks from reactors damaged by last week's devastating earthquake and tsunami. But while most hurry in the opposite direction, about 180 plant workers are staying put -- despite the fact that doing so could result in serious illness or even death -- to battle the meltdown threat. "The workers at this site are involved in a heroic endeavor," former U.S. Department of Energy Official Robert Alvarez told CNN. "There is at least fragmentary evidence that in some places on this site there are life-threatening doses of radiation. I think they are doing enormously heroic work"
The workers left at the site are said to be highly trained and experienced nuclear operators, engineers and safety staff with highly specialized knowledge. Professor Richard Wakeford, of the Dalton Nuclear Institute at the University of Manchester, said for many of them -- despite the highly unusual and potentially dangerous circumstances -- it will be just another day at the office. Read the whole thing to see what these workers are facing. It's not as bad as the situation at Chernobyl was, but it's still fraught with many risks. Not just radiation, but hydrogen explosions as well. I see they are now beginning to . They are working under very trying circumstances. Lets say our prayers that they can get through it, and that the situation can be brought under control. ARAHAMA, Miyagi Prefecture—When the tsunami warnings sounded after the massive earthquake that struck Japan on Friday, Masaki Kikuchi sprinted upstairs to grab his sleeping 12-year-old daughter before racing away to escape the rushing waters. In the backyard tied to a small shed, Mr. Kikuchi left behind two dogs: Towa, a two-year-old Sheltie and Melody, a one-year-old Golden Retriever. Mr. Kikuchi assumed the giant tsunami that flattened his neighbors' homes and whisked away their cars probably killed Towa and Melody too. Koya Kikuchi, the 20-year-old daughter of Mr. Kikuchi, was riding the bus home from her job at a local restaurant. When the earthquake struck, a power line fell in front of the bus and passengers started filing out. She rushed to her cousin's house, which was nearby. She asked her cousin to drive her back home because she wanted to go save the dogs that she had begged her father to get. Within a half-mile of her home, police stopped the car. They told Ms. Kikuchi that a tsunami was coming and she could not go any farther. But they weren't. Read the whole thing. Link has video too. Radiation from Japan. What it means. [...] Many experts agreed that radiation would likely dissipate and pose far less danger to people farther away, especially those in other countries. For one, radioactive cesium and iodine can combine with the salt in sea water to become sodium iodide and cesium chloride, which are common elements that would readily dilute in the wide expanse of the Pacific, according to Steven Reese, director of the Radiation Center at Oregon State. Winds in the area are currently blowing toward the coast because of a winter storm. But that will change to a brisk wind blowing out to sea at least through Wednesday, he said. Even so, many experts here say that this emergency is still nowhere near the level of Chernobyl, the worst nuclear disaster in history. For one, that reactor's core contained graphite that caught fire, which blasted radiation high into the air and into wind currents that carried it long distances. The Japanese core is metal and contains no graphite, experts said. The Chernobyl plant also lacked a heavy shell around the reactor core. And the incident there happened quickly, with little time to warn nearby residents. So far, the radiation released in Japan has not reached high altitudes, said Kathryn Higley, director of the Oregon State University Department of Nuclear Engineering and Radiation Health Physics. "In addition, radioactive material is sticky. It has a static charge," she said, so it will stick to the sides of buildings, and "rain is going to knock it down." As a precaution, the World Meteorological Organization has activated specialized weather centers to monitor the situation. Those centers, in Beijing, Tokyo and Obninsk, Russia, will track any contaminants. Japanese officals said that, early Wednesday, the level of radiation at the plant surged to 1,000 millisieverts before coming down to 800 to 600 millisieverts. Still, that was far more than the average. Doctors say radiation sickness sets in at 1,000 millisieverts and includes nausea and vomiting. Damage to blood cells can show up two to four weeks later, said Dr. Fred Mettler, a University of New Mexico radiologist and adviser to the United Nations on radiation safety. He led an international study of health effects after the Chernobyl disaster. Levels are still likely to be lower away from the plant, said Kelly Classic, a radiation physicist at the Mayo Clinic and a representative for the Health Physics Society, an organization of radiation safety specialists. The U.S. Nuclear Regulatory Commission says doses of less than 100 millisieverts, or 10 rems, over a year are not a health concern. By comparison, most people receive about three-tenths of a rem every year from natural background radiation, according the U.S. Environmental Protection Agency. A chest X-ray delivers about .1 millisieverts, or .01 rem of radiation; a CT scan of the abdomen and pelvis is about 14 millisieverts, or 1.4 rems. If a full meltdown occurs at the Japanese plant, the health risks become much greater — with potential release of uranium and plutonium, said Dan Sprau, an environmental health professor and radiation safety expert at East Carolina University in Greenville, N.C.
"If that escapes," Sprau said, "you've got a whole new ball game there." That's the big question; will it get worse, and if so, by how much? 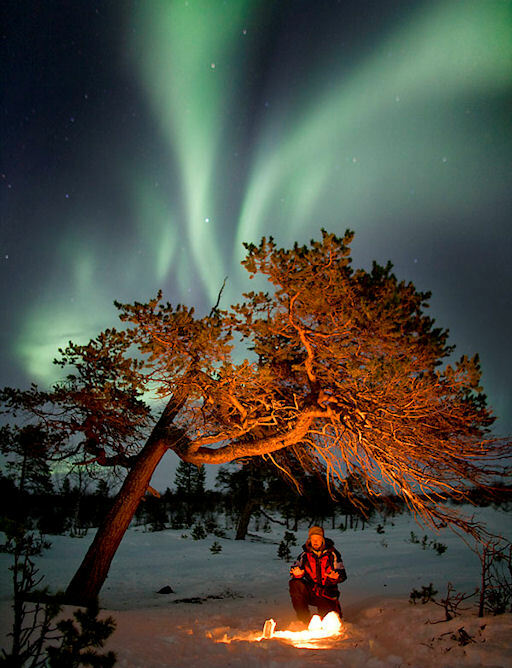 "When I was sitting next to the fire and had the Aurora dancing above me, I felt like it could have been 100 years ago," says photographer Peter Rosén in Sweden's Abisko National Park. "I wonder what people thought when they saw this phenomenon in centuries past. Old stories say that the Sami people believed the Aurora was home for the spirits of the dead, and that we should show respect when the lights appeared." They could appear again, soon. A new solar wind stream is buffeting Earth's magnetic field today, and NOAA forecasters estimate a 10% chance of severe geomagnetic storms. Get your aurora alerts here! Sunspots are continuing. Solar storms, not so much. For now. CAUTIONARY TALE: This week marks the 22nd anniversary of the Quebec Blackout. On March 13, 1989, a geomagnetic storm brought down Hydro-Québec's power grid and blacked out the entire province. Brownouts and other power irregularities were experienced across much of North America. Today's "smart power grids" are even more vulnerable because they are interconnected by high voltage lines spanning thousands of miles. In good times, this arrangement allows utilities to guide power wherever it might be needed. During geomagnetic storms, however, it spreads the danger of a blackout far and wide. What we need is a Solar Shield. The Solar Shield article is interesting, it mentions the Quebec event of March 13th 1989, and other storms like the Carrington event of 1859. The Shield is a warning system that interprets solar data and alerts utility companies to act accordingly. Our growing reliance on satellite technology, and it's vulnerability to solar flares. Why it matters. Who is worse, Gadhafi or the Rebels? Does Obama really want Gadhafi to go? "Yes Gadhafi is a very bad guy. But he quit the terrorism business a decade ago and paid compensation to the families of victims of the Lockerbie bombing. He surrendered his nuclear program in 2003. He cooperates with the EU in stopping illegal migration into Italy. "He is a reliable oil supplier and a good customer for U.S. companies and our allies. Gadhafi is reopening Libya to Western energy firms like BP. He buys grain from Western suppliers. One Canadian firm, SNC-Lavalin, has a $275 million contract to build Gadhafi a new prison. A regime overthrow would wreck that contract and many others besides. "Do we want to take the chance of replacing Gadhafi with a Mediterranean Somalia? Tribal leaders, fighting each other, inspired by Islamic ideology -- all just 300 miles from the coast of Sicily? We could have 300,000 refugees showing up on the NATO side of the Mediterranean. Better stick with the devil we know. The bloodletting cannot last much longer, stability will return soon." Gadhafi's a dictator, everyone knows it. But the reason he's lasted so long is, no one can see an alternative that's better. Unless one presents itself, I doubt you will see a rush to get rid of him. If his iron fisted rule has been keeping a lid on something possibly even worse, then ousting him could be very dangerous. But then too, he's old, and won't last forever. The choice is a bit like choosing between a rock and a hard place. If you follow the link, the site offers a series of photos with a scroll bar beneath, and the before picture is covered over with the after picture. The sheer enormity of the destruction boggles the mind. Sendai, Japan (CNN) -- In a nation already besieged with grief over mounting casualties, fears of possible radiation and the threat of more earthquakes, thousands of bodies reportedly surfaced Monday, and a government official confirmed another explosion at a nuclear reactor building. The official death toll reached 1,647 on Monday. But the numbers did not take into account the 2,000 bodies that Japan's Kyodo News said had been found in the hard-hit Miyagi Prefecture on Japan's northeast coast. The Tsunami Map Viewer returns a map of areas with Tsunami Evacuation Zones based on information that you enter. The part where you enter an address, does not work for me. Below that is a search box labeled "Search By a Coastal Area". It has a drop down menu. Pick an area from the menu, and it will show you a map, with flood areas highlighted in yellow. The Oregon Department of Geology and Mineral Industries (DOGAMI), in partnership with NOAA, is developing new tsunami evacuation maps and revising current maps for the entire Oregon coast. The anticipated date of completion of this project is 2013. The interactive map on this website depicts first generation evacuation maps developed between 1995 and 2006 that show evacuation zones in yellow based on the maximum inundation expected for a local Cascadia tsunami. This maps on this website incorporate new information and technology gained since the 2004 Indian Ocean tsunami that have aided the development of a second generation of evacuation maps. The new maps depict the maximum extent of inundation expected for both distant tsunamis (orange) and a local Cascadia tsunamis (yellow). Since the Japan earthquake, there have been people in the media claiming that a Cascadia quake would be very similar to the one in Japan. I believe the inundation maps are based on a 9 point richter scale quake on the Cascadia fault zone. There hasn't been a large subduction zone quake in Oregon since 1700, or so geologists tell us. They also say that at that time a 10 foot wall of mud and water washed inland over low lying areas. They base their guess on fossilized remains of Indian settlements that were buried under a layer of mud in that time period (sorry, I didn't save the link). How accurate their estimate is, I couldn't say. A 10ft wave, while serious, isn't the 33 ft waves Japan had just had. In general, there are not many quakes in Oregon. I've lived here since 2004 and have not even felt one. But they do happen occasionally. Mostly they are small, with a few exceptions. Because Oregon is not as seismically active as Japan, I don't know how apt the comparison is. But does the lack of earthquakes here make us complacent? Perhaps. So just how serious is the potential threat? [...] There are numerous fault zones in Oregon. A graphical representation is available from the University of Oregon. The information below about earthquake hazards in Oregon is exerpted from an FAQ by the Oregon Department of Geology and Mineral Industries. Q: Is there an earthquake hazard in Oregon? A: YES! There have been no “big” earthquakes in Oregon’s brief history, and there is no question that damaging earthquakes have been far less frequent in Oregon than in California or Washington. However, geologic research tells scientists that Oregon will some day experience big earthquakes, and the Scotts Mills earthquake of March 25, 1993, and the Klamath Falls earthquake of September 20, 1993, confirm the research. Because we are poorly prepared, the damage could be great. We are faced with a small chance of a great disaster. Q: What about “The Big One”? A: Geologic research in the last few years has shown that Oregon and Washington have probably been shaken by numerous subduction zone earthquakes during the last several thousand years. 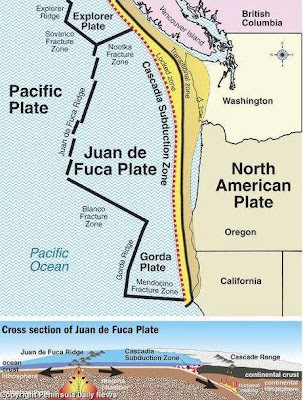 Subduction zone earthquakes occur when two great crustal plates slide past each other beneath the coast of Oregon and Washington. These earthquakes occur, on average, every 300-600 years, and the most recent was about 300 years ago. 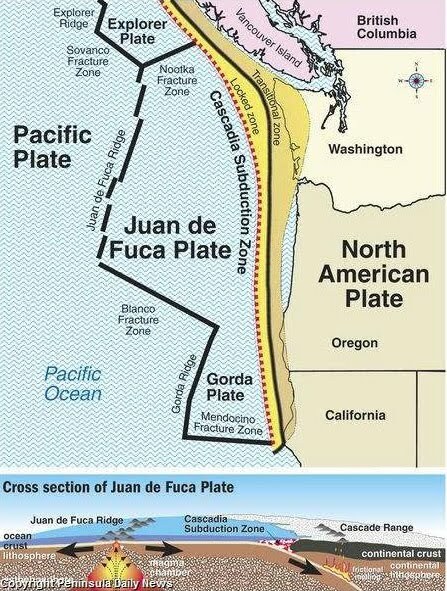 The subduction zone earthquakes were probably centered just off the coast of Oregon and Washington and may have been as large as magnitude 8 to magnitude 9. Such earthquakes would cause significant shaking and damage in much of western Oregon. Scientists cannot predict whether the next such event might occur in two years or 200 years. Q: What parts of western Oregon are most dangerous? A: Local earthquakes are most common in the Portland metropolitan area, northern Willamette Valley, and Klamath Falls area and may threaten the coast from Coos Bay south to Brookings. We simply do not know about the risk of local earthquakes in most other parts of Western Oregon. All of Oregon west of the Cascades is at risk from subduction-zone earthquakes. The amount of earthquake damage at any place will depend on its distance from the epicenter, local soil conditions, and types of construction. There are so many variables. And a great deal of uncertainty. Perhaps the best we can do is to be prepared for the worst, and hope for the best. At any rate, preparation can help minimize the damage and enhance the recovery, whatever the size and scope of an event, whenever it may happen. When does cut funding = freedom of speech? [...] This week's brouhaha has underlined the single biggest problem with public broadcasting from the fan's point of view: namely, that with taxpayer financing, no matter how small, inevitably comes political considerations and even outright interference. What did Sting teach us? If you love someone, set them free. Should NPR lose its federal funding tomorrow, we would see the mother of all pledge drives, and I would be first in line to contribute. As a friend told me this week, "I would actually start giving them money if they'd stop taking it from me." NPR has one the best media brands in the country; you don't think George Soros would be willing to up his annual contribution to cover the shortfall? De-coupling from the federal government would allow NPR to sell advertising. Its executives could talk as much trash as they want to about Republicans and Tea Partiers, and few people would care. On NPR recently, someone complained that NPR is like a sweater; if you cut government spending, the sleeves will fall off. Well, guess what? Short sleeves are IN this year! I'm sure NPR would adapt, and learn to do more with less like everyone else. Or perhaps even raise revenue in new ways. In the long run, I think it would work out better for everyone. Read the letter. Look who signed it. They are using their position, and their income based on taxpayers dollars, to intimidate voters and taxpayers. How would you like to get a letter from representatives of the police, and other government services, telling you to who to support pollitically, "... or else"? Shame on them. Who is to be master of our municipal and state governments? The voters or the “public servants.” Shame on them. SHAME. 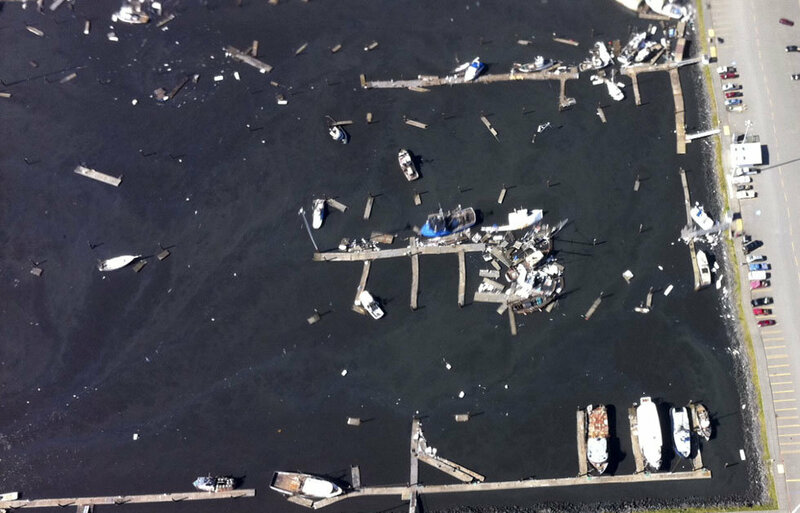 [...] The Port of Brookings Harbor sustained heavy damage Friday as walls of water flushed through the port area. Port manager Ted Fitzgerald estimated the damage to docks, pilings and port facilities at $10 million. That doesn't include the damage caused to and by boats, at least three of which sank in the basin. Many others were swept out to sea. 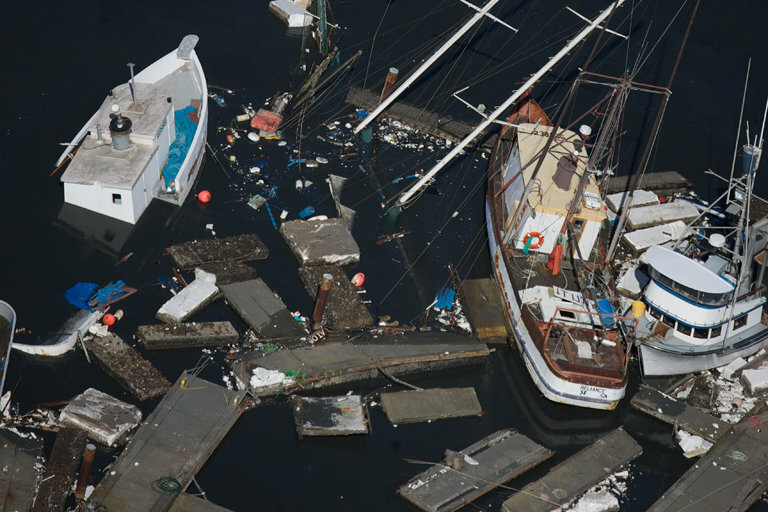 Many of the boats that remained in the basin have suffered extensive damage when the waters send the 220-ton fishing vessel Haida careening through the marina. The boat's owner was unable to steer it because it was without its engine at the time. 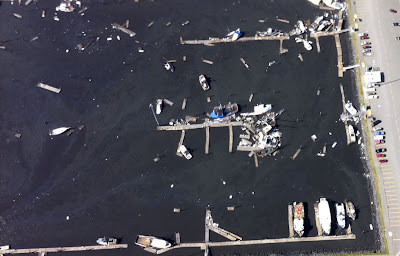 The rising waters created "a rat's nest" of pilings, boats, snapped masts and slabs of dock, Fitzgerald said. "It was absolutely unstoppable. It happened at least three times, really hard," he said. "We had to keep taking it." Chris Cantwell, the port's operations supervisor said 70 percent of the port's commercial basin was destroyed. "A third of our sports basin destroyed. We have boats on top of another. Probably half-a-dozen sunk," he told The Oregonian. Cantwell said the first wall of water came in about 8:05 a.m. Friday. Three waves in all came in before 10 a.m. The third one inflicted the most damage. Cantwell said each of the waves was about 3 feet high. "By the time the third one came in, things were loosened up," he added. "It was flipping boats on top of one another. We pretty much have a major disaster here." Brookings City Manager Gary Milliman said about 60 to 85 percent of the commercial dock is destroyed. Seven boats were swept out to sea, while several others sank or sustained severe damage, he said. The body of a man was also discovered on one of the boats, but the Curry County sheriff had told Milliman it is unclear whether the death resulted from the tsunami. The port was without power as evening fell, with scores of local residents gathered to survey the wreckage. Near Coos Bay, surges of water rushed in and out of the port, simulating a high tide and low tide cycle every 15 minutes, said Coast Guard Boatswain's Mate First Class Walter Morey. "It did that like 12 times in three hours," he said. "It's pretty impressive to see this happen right in front of your eyes." The water traveled at a fast clip as well, about three times the typical speed, he said. Read the whole thing for embedded links, more reports from other locations, more photos and a video. As awful as it is, it's nothing compared to what Japan is going through. A very sobering thought. Earthquakes and solar flares? Coincidence? (TheWeatherSpace.com) -- Japan was hit by a magnitude 8.9 quake on Friday afternoon and it happened when a shockwave from an X-Class flare hit the planet during a 24 hour window. Scientists do not understand yet what causes earthquakes, however there have been connections to heightened solar activity being one of the many possible triggers. Meteorologist Kevin Martin studied geomagnetic field patterns in space weather since the early 2000s. TWS Editor Warren Miller woke him up to get his word on the quake triggers. Is the Tea Party's approach to debt flawed? NEW YORK (CNNMoney) -- First, let's give the Tea Party props for thinking critically about how much money the government should spend -- energizing the debate about the national debt. Now for the fact check: Some of the Tea Party arguments for how to address deficits are just plain misguided. Here are four assertions Tea Partiers make that don't pass the sniff test. 1. To kill debt, cut spending but don't raise taxes: A staple Tea Party promise is to cut spending and keep taxes low. "[Americans] want spending cuts now, not in ten years. They don't want more job-killing tax increases," Rep. Joe Walsh of Illinois said in a recent statement. Walsh went on to say that the $100 billion in spending cuts that many in the House GOP wanted to make over the next seven months "is what tackling the deficit looks like." Budget experts on the left and right say successful debt reduction can only occur when spending is cut across all areas of the budget. And excluding revenue increases from the mix is the equivalent of one hand clapping: ineffective given the size of the country's debt. Ronald Reagan, often revered as the king of small government and low taxes, signed into law some of the biggest tax cuts in modern history. But Reagan also approved some of the biggest tax increases, too. And he did so to help reduce swelling deficits. Read the whole thing, which contains embedded links and a video too. I could nit-pik some things, but there are some relevant points made. Because we already are in debt, we have to manage the existing debt, while simultaneously trying to reduce it. So many things are interconnected, if you suddenly cut off some things, there will be chain reactions in other areas. It's almost like we have to back our way out of some things, before we can start cutting them. Just as it took time to get this messed up, it's going to take some time to get out. But thrashing about wildly could be just as bad as paralysis. We need to find that middle path that works, with minimal time wasted and optimal damage control. It may mean some compromises for an interim period. I pray that Congress is up to the task. They must be. It's workable, and makes sense in so many ways. NEW YORK (CNNMoney) -- Pimco's Total Return Fund (PTTRX), the world's biggest bond fund, slashed its exposure to U.S. government debt to zero last month. It's the second month in a row that well-known fund manager Bill Gross has drastically reduced Pimco's exposure to U.S. government debt. Gross has been very vocal about his feelings toward U.S. interest rates, saying in January that they were "robbing" investors and that U.S. government debt should be "exorcized" from investors' portfolios. The Total Return Fund held about 22% of its holdings in U.S. government debt as recently as December, but reduced those holdings to about 12% in January. Gross's comments typically carry considerable influence on investors because his Total Return Fund is by far the world's largest bond fund with more than $240 billion in assets under management. It's also the best-performing bond fund for the last 15 years, according to Morningstar.com. And what affect will this have on people's confidence in US bonds? It's not hard to guess. There were warnings last year that the Bond Market won't wait much longer for us to get our house in order, to balance our budget. Is that what's coming to pass now? At one time in this country, there were few workplace safety laws, few restraints on employers, and incredibly exploitive working conditions that ranged from slavery, to share cropping, to putting children in dangerous working conditions. Unions, to their everlasting credit, helped play an important role in leveling the playing field for workers. However, as the laws changed, there was less and less need for unions. Because of that, union membership shrank. In response, the unions became more explicitly involved in politics. Over time, they managed to co-opt the Democratic Party, pull their strings, and rewrite our labor laws in their favor. As Lord Acton noted, "Power tends to corrupt," and that has certainly been true for the unions. Unions have become selfish, extremely greedy, and even thuggish in their never-ending quest to take in as much as they can for themselves, at the expense of everyone else who crosses their path. It goes on to give 5 excellent examples of how the unions have been bilking taxpayers, demonstrating why it must not be allowed to continue. For all our sakes. 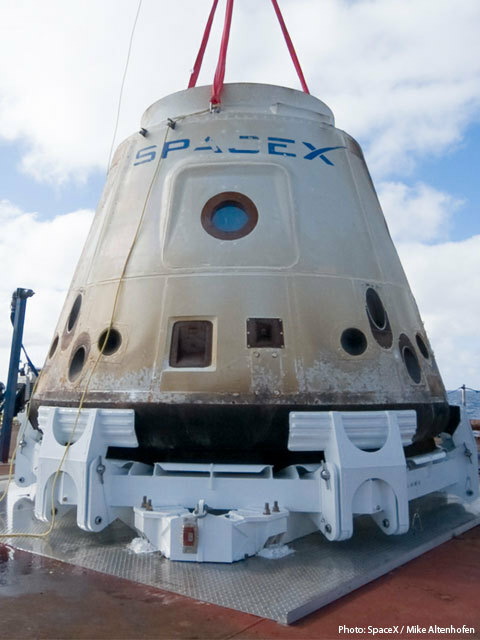 Discovery Returns to Earth. And Retirement. [...] Discovery is the first of NASA's three flying space shuttles to retire, and the most prolific of the trio. It has flown the most missions (39 flights), traveled the farthest (148 million miles) and carried the most astronauts (246 crew members) during its storied 27-year spaceflight career. 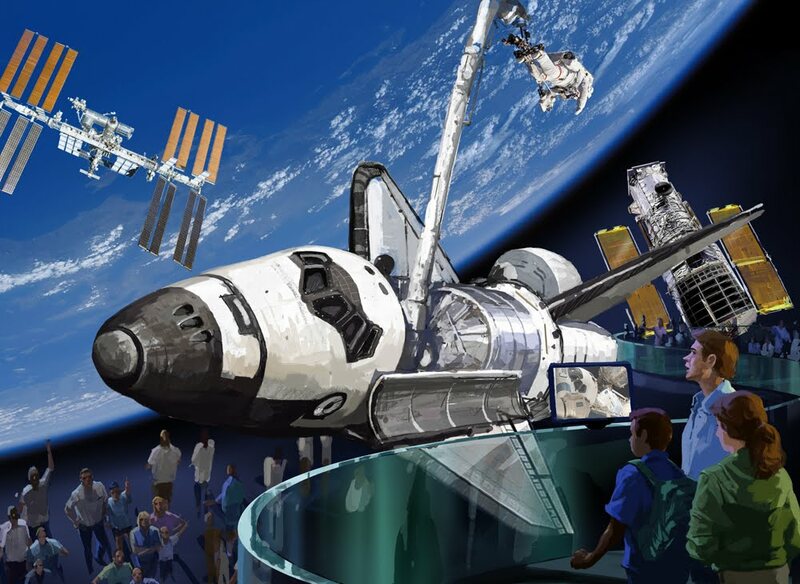 While Discovery is expected to go to the Smithsonian, there are about 29 museums currently competing for NASA's three space-flown shuttles, as well as Enterprise — a shuttle prototype used for landing tests, but which never flew in space. I heard on the radio that Discovery is still in good shape and capable of flying several more missions, but that won't happen because the programs been defunded. Now they are going to spend 28.8 million on each shuttle, to turn them into museum pieces. I hope we got our monies worth. She's a grandma at age 29? Nobody wants their children to repeat their mistakes and we all wish we could issue our children a book with all the things we did wrong and all the things they shouldn't try. Unfortunately, that isn't a reality. And one 29-year-old in the UK knows just how true that is. She is going to be a grandmother before she is even 30. Kelly John is set to become Britain's youngest grandmother at 29. She said it was her worst nightmare come true when she found out her 14-year-old daughter was pregnant. She said she hoped her daughter Tia wouldn't repeat her mistake (don't we all), but she did and the grandmother is now vowing to help her daughter in every way she can. Not many, I'll bet. At least let's hope not. First there was the Juan Williams debacle, thanks to Vivian Schiller. Then there was Vivian Schiller's Grand Scheme for putting local news agencies out of business so NPR could take them over, creating a government subsidized news monopoly. Now there's the Ron Schiller debacle. Vivian throws Ron under the bus. Then NPR's board of directors throws Vivian under the bus. Who cares? You know they are going to be replaced with left-wing dingbats who think exactly the same way as the people they are replacing. I heard NPR on the air yesterday, trying to spin this, denying they believe any of the things that they said. I simply don't believe them. I've listened to them for YEARS; it's pretty obvious what they believe. When will they start being honest about it? NPR can say or do whatever they like. It's a free country, and I support their right to express their opinions. However, they can do it on their own dime, like everyone else. As a taxpayer, I don't wish to pay to promote ideas I don't approve of. I've listened to NPR for decades. Some of the programing is nonpartisan, but most of it is biased towards the Left. It often offends me. I can deal with that, but I definitely don't want my tax dollars subsidizing it. If they don't like the loss of revenue, they can run commercials like everyone else. Maybe even broaden their market share by trying to appeal to a wider audience? There's a novel idea! They won't disappear, they will just have to adapt. And now is the time for it. President Obama, the "Blank Screen"
In the prologue to the second of his autobiographies, "The Audacity of Hope," Barack Obama said: "I serve as a blank screen on which people of vastly different political stripes project their own views." Stanford University professor Shelby Steele, who, like Mr. Obama, has a black father and a white mother, thinks the key to Mr. Obama's popularity in 2008 was his racial identity. "Obama's special charisma ... always came much more from the racial idealism he embodied than from his political ideas," wrote Mr. Steele. Being a "blank screen on which people of vastly different political stripes project their own views" is a good way to be elected president ... especially when the incumbent is saddled with an unpopular war and the stock market melts down two months before the election. But after two years in office, that blank screen can look more like an empty suit. No surprise there. If you vote for a blank screen, no matter what you project onto it, sooner or later you will be faced with whatever was really there all along. "Obama’s deep thinking is ultimately bogus"
[...] Time and again, when the impressive thing would be to make a strong and timely decision — and to make a clear case for it — Obama hesitates, vacillates, equivocates, and ends up, as in the matter of gay marriage, making a muddle of things and riling up pretty much everybody; and instead of recognizing this habit as a weakness, Obama himself shows every sign of considering it a virtue, a mark of excellence, that distinguishes him from lesser — which is to say less cognitively inclined — beings. Obama’s deep thinking is ultimately bogus. It’s as if he’s posing for Rodin, elbow on knee, chin on fist — all the while staring in a mirror, pleased by what he sees. It seems to me that many people gravitated to, and chose Obama, for reasons more emotional than rational. Emotional ideas people projected onto him, rather than observing what was really there. Emotions can be deceptive though, especially if you use them as your only guide. Emotions, no matter how sincerely felt, that are based on fantasy rather than fact, can get you into lots of trouble. That's why human beings have both emotions and a rational mind; we are meant to use them both. They balance each other. They should be used together. [...] The video above shows a representative of the United Healthcare Workers from a budget hearing in California in 2009. She makes it clear that the union got ‘democrats’ elected and that they [the union] ‘have long memories’ should the members deign to not support the union demands. If the officials support needed measures to cut spending, the representative will unleash her members to campaign against their reelection. And her threats are all legally sanctioned. And they are paid for by us. This is the central problem with public sector unions. They get to use taxpayer money to elect their bosses and they get to use taxpayer money to convince their bosses to give them more taxpayer money. If we can’t break this corrupt cycle, no other policy decisions we make will matter. Yes, it is that important. The whole article is worth reading, for the "how" and "why" of it. How government employee unions went from being reasonable and fair, to being the exploiting extortionists they are today. It's why even FDR believed in limits on Public Employee unions. The way it is now, it's legally sanctioned extortion. It must end, and the taxpayers must be the ones to insist that it does. The unions will still exist, and they won't be powerless. But they will have limits on their GREED and THUGGERY. It's time for them to have a reality check and join the rest of us. In the summer of 2008 as McCain and Obama were in the midst of their campaigns to capture the presidency, a series of events dramatically changed the focus of the campaign from Iraq to the economy. From that point on, Obama took the lead and eventually won the presidency. Now, a full two years later, the Pentagon has issued a report on the series of events that led to the 2008 economic crash. Notable for its absence is any suggestion that the economic events that arguably catapulted Obama into the White House may have originated in our own political system. The series of 'inadvertent errors', deliberate obstruction, political shenanigans, behind the scenes manipulation of the money markets and non-stop calls for immediate infusions of taxpayer cash brought the U.S. to its knees by February 2009. And continues to this day. This author believes there is enough information to at least consider that this crisis was manufactured for political gain. Right here at home. Read the whole thing, it's brief. Connect the dots. Look at the time line of events, and who the players were. Clearly there were several opportunities where Democrats should have zigged, but zagged instead. Creating a crisis that they exploited, and continue to exploit even now. The Gravy Train is over. Taxpayers like me who have to provide for my own healthcare and retirement plans will not tolerate having to provide for cushy union pensions as well, promised to the unions decades ago by some now forgotten politicians, who conveniently passed the debt on to future generations. MY consent was not given for it, and it's my tax dollars they are wanting to take. [...] I agree with President Franklin D. Roosevelt, who said "the process of collective bargaining, as usually understood, cannot be transplanted into the public service." The Battle of Wisconsin has focused public attention on a fiscal reality. Whatever the necessity and value of public-sector jobs, federal, state and local governments simply can't sustain their current costs. Irrational unionists and media liberals have preposterously compared duly-elected Gov. Scott Walker and Republican legislators in Wisconsin to anti-democratic dictators. In fact, it's just the opposite. This is democracy at work. Wisconsin voters in 2010 ousted Democrats and gave majority control of their legislature and the governor's office to the GOP. Walker campaigned on exactly the measures he's now taking in regard to balancing the budget, reining in excessive compensation for public employees and restricting their collective bargaining privileges, as is done in 24 other states. The unions aren't being destroyed. They ARE getting a reality check. One that, IMO, is long overdue. They need to learn to deal with reality, like the rest of us. Well, I suppose a talking computer in space that Tweets is better than one that murders astronauts while they sleep. If you read the whole article though, it sounds like they are thinking of maybe merging this talking robot with Robonaut 2. So, would such a hybrid be like "HAL", only with hands? "Handy HAL, the handyman". Butler, companion, and potential axe-murderer all in one.